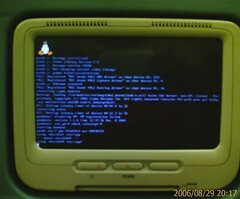 My good friend Iranga, had taken this photo (on his way to SL from UK) of the Linux kernel booting on the on-flight personal entertainment system of a First Choice Airline. So I guess, First Choice has chosen GNU/Linux as its first choice! Iranga told me that once the kernel booted it loaded a kiosk like interface. This is air bus entertainment system.. It’s run on Linux and that crash pretty often. Normally once the crew restarts it, it starts work back again normal. Well that could happen if the hardware is flakey. But this had happened at the begining of the flight, so probably they were just turning it on. flakey hardware on Airbus?? Don’t even think about it! It is Airbus! Thanks a lot for that link. It was much fun reading all those comments :) Well when reading those comments it seems people are either on the assmption that Linux didn't creash or there was a hardware problem (with the hard drive). You could well have flaky hardware even on the Airbus as this is just for the inflight entertainment system which isn't going to kill anyone. Yet it is possible that the hardware is good and Linux still crashed given that most of these systems are fitted by the same manifacturer who might have a buggy version of a Linux distro. But that senario is somewhat unlikely. The more likely thing is a faulty hardware, and the hard disk seems much likely, specially when you consider the turbulence. Looks like they are running a thin client which connects to a powerful server and sometimes they might have some sort of network problem and their kiosk application crashes. So like you said, instead of restarting the application, or fixing the application they probably just reboot the system.